While digging around for something to write about this week I stumbled upon a transcript from a pretty cool podcast I appeared on several years ago. The show, Talking Fin Lit, which was sponsored by McGraw-Hill, was designed to look at issues of financial literacy and education. Host Mark Gura interviewed me at length about The Checkbook Project, and since March is the ideal time to kick off checkbooks in the classroom, I thought it might be neat to share some of the material. What’s here is actually the “pre-interview.” Though the show is no longer being produced, the web portal is still there, meaning you can hear the actual interview here. TFL: We’ll start out by my asking you for your background. How long have you been a teacher? Curriculum writer? Describe your current involvement in Education, etc. I’ve been teaching for twenty years. I’m currently teaching 4th and 5th grade in southern Oregon. I started writing material for Scholastic in 1998. My editor at Storyworks, one of the classroom magazines, has kind of championed my work, giving me opportunities to write for Scope, Scholastic News, Instructor, and other divisions. I’ve also published three books through Scholastic Teaching Resources. When it comes to curriculum writing, I suspect every teacher is a curriculum writer to some degree. You get so much material thrown at you that just doesn’t work, material created by people who don’t actually teach, who don’t understand the realities of the classroom, and who certainly don’t know the unique needs of your given class, you end up creating your own. I think what you see at TeachersPayTeachers, the website where people can purchase teacher-created curriculum, is something of a backlash against the big textbook companies. Not only is everything there created by people on the front lines of teaching, but it’s comparatively cheap, you can buy only what you need, and it’s kid-tested. TFL: What attracted you to create Financial Literacy Curriculum? I work hard to help kids connect what they do in school with the real world. Creating The Checkbook Project was an attempt to do that. Kids and their families today tend to dismiss the importance of education—I call it “academic apathy.” It was particularly profound in a class I had six or seven years ago [now ten or twelve years ago]. In an effort to motivate that group of children, I started developing The Checkbook Project. It helped them connect their work habits with the real world. They could see the relationship between their habits and their financial or material success. From a business standpoint, I’m using it to drive traffic to my website and to showcase the quality of my other material on TpT. Of course, I could have done that with one of my other products just a easily. I’m pretty cynical about the way our society operates these day. I look at our economy and I see snake-oil salesmen at every turn. Those with financial savvy are taking advantage of a populace with very little financial sense. I want my students to see how the real world works so that they don’t become victims. Maybe I see making The Checkbook Project available for free as a way to stick it to The Man just a bit. TFL: On your profile at TpT you state, “They’re my kids, so naturally I want the best for them. The materials I create are designed to give them the most academically-rewarding and personally enjoyable school experience possible.” How does The Checkbook Project reflect that understanding and philosophy? My students love coming to class, and a big reason is the kid-centric activities I use. The Checkbook Project is especially engaging. Kids clamor to be in my class because of it. These days, my colleagues have all adopted it, so every 4th and 5th grader in our building gets to participate. A micro-society is a great way to describe it. In short, kids get paid for the work they do in the classroom. For example, they earn $1 for each percentage point on tests they’ve passed, they get paid for classroom jobs, and they earn money for turning in their homework. You could say it’s imaginary money, but it really isn’t because they turn around and use their earnings to pay rent on their desks, buy goods and services, and pay taxes. 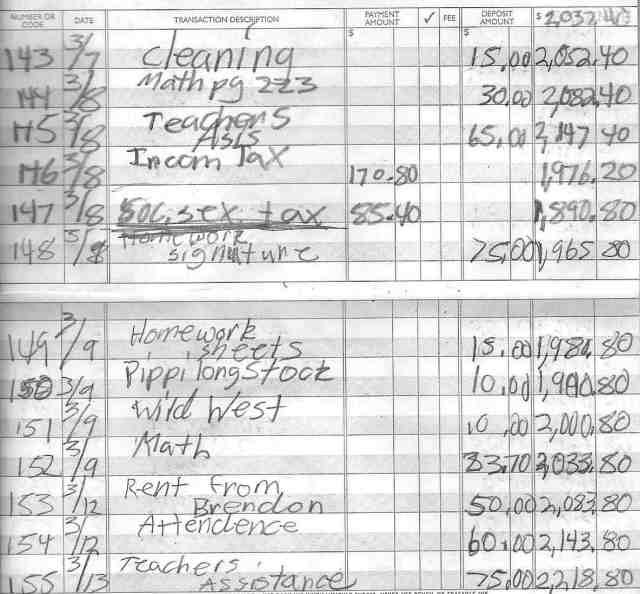 They keep track of all this in checkbook registers donated by local banks, and they report their earnings on a weekly tax report. Each year the classroom economy takes on a life of its own. Kids start businesses, some selling products such as school supplies, jewelry, or candy, and others offering services such as desk cleaning. I’ve had kids start charities or become landlords. Every year some ingenious kid comes up with a new twist, and its always organic. All I do is get it started. TFL: How did you come to develop The Checkbook Project? I had a class of kids who were seriously apathetic about school. They didn’t care whether they passed tests or got good grades. Their parents didn’t seem to care if they did homework or even came to school. The Checkbook Project was designed to motivate them. The financial literacy that comes with it is a natural outcome. TFL: What do you feel/know your students get from it? The kids tend to improve their work ethic. They see the relationship between their work habits and financial success, and therefore make connections with the real world. It focuses kids on their habits, behaviors, and judgment. Four years ago I had an extremely challenging class of kids, a class widely known for its poor behavior and thuggery; but after using The Checkbook Project for three months, it finished the year as one of the best classes in the school. TFL: What sorts of response and feedback have you gotten from: Students? Parents? Supervisors? Replicating colleagues? Everyone who has witnessed The Checkbook Project at work in my classroom has praised it. Because a non-performing student can become “homeless” or “bankrupt,” I always worry about offending parents, so I make a point to say that we’d rather have the kids learn these harsh lessons in 5th grade than in real life. Parents seem to get that. TFL: Please describe the materials that are available for teachers interested in replicating… what sorts of materials have you produced? And how can teachers get them? How might they be modified? You can get The Checkbook Project guide for free on my storefront at TpT. The guide provides the “how-to.” I also have a variety of helpful student forms on my website at macklewis.com. The tax report is a must have, but there is also a fun classroom job application, a desk rental agreement, and many others. TFL: What next? How would you like to further refine this program? Extend it? Each season I try to add another piece based on where my kids and colleagues take it. Perhaps at some point I’ll package it up and offer it to my publisher. We’ll see. TFL: Would you care to comment about the state of Personal Finance readiness/sophistication that US kids demonstrate? The state of Financial Literacy Education? I find it interesting that in many high schools, students are required to take calculus or trigonometry, yet they no longer take any form of consumer math. It seems to me that for the average kid, the skills learned in consumer math are far more likely to be needed in the real world. TFL: What would you best advice be to educators who are just about to start a program of personal finance or who have started but need to refine and deepen their program now? Not that I’m trying to sell my program—after all, it’s free—but I’d encourage them to go to my website and take a look at it. Desk Rent is Due Friday! No doubt you’ve had kids ask, “Why do we need to know this stuff?” In my classroom, we spend a lot of time talking about the “real world,” and nothing we do is more “real world” than The Checkbook Project. In my building, we implement it around this time of year with all our 4th and 5th graders. If we waited any longer, the kids would riot! The homeless shelter is a single desk around which kids gather when they don’t have the resources to rent their desks. Granted, it sounds a bit harsh. It may even be a bit controversial. Certainly, it gives me no pleasure to see Stevie, Pablo, or Cynthia crowded around a single desk at the front of the room. But isn’t it better Stevie, Pablo, and Cynthia experience the consequences of poor work ethic in fifth grade rather than on the mean streets of real life? After all, homeless shelters do exist in the real world, and perhaps it’s the threat of landing there that keep many of us working hard. Poverty and homelessness are serious problems in America. There are plenty of folks out there facing such grim prospects despite their best efforts. The Checkbook Project isn’t meant to degrade them. Better, the project prompts numerous discussions on the subject. One of my favorites is about how the guy holding that sign on the freeway ramp got there. Students have a host of preconceived notions and theories about homelessness, including that he might not be standing there at all had his fifth grade teacher used The Checkbook Project. I’ve also seen the Homeless Shelter bring about the best in my students. If you implement The Checkbook Project, you’ll see neighbors help neighbors make rent. You’ll see students push their buddies to get their work done. One year I even had a kid start a charity organization. He maintained a second register in which he collected donations from his classmates and doled out grants to needy students who were short on rent. I recently received a text from a former student-teacher telling me her administration has told her to disband or at least rename her “homeless shelter.” I wish I were there to lobby her principal and parents, but she’s half way across the country. The best I can do is suggest some politically-correct alternatives. “Group house”, “hostel”, and “shared housing” come to mind. So too does “Dickens’ House” and “Grandma’s Basement.” (Okay, that last one may not be so politically-correct.) Regardless of the name, whether it’s a homeless shelter or merely communal living, it will likely motivate struggling students to work a bit harder. I created The Checkbook Project over a decade ago to combat what I call “academic apathy.” Over the years it has consistently proven itself to be an engaging way to get kids invested in their studies, teach work ethic, and give kids “real world” experience within the safe confines of the classroom. And because I believe these are essential lessons every kid needs, it’s also free. Every last bit of it. For more details on how it works, click here. Okay kids, fork over those taxes! I created The Checkbook Project nearly a decade ago to combat what I call “academic apathy.” Over the years it has consistently proven itself to be an engaging way to get kids invested in their studies, teach work ethic, and give kids “real world” experience in the safety of the classroom. And because I believe these are essential lessons every kid needs, it’s also free. Every last bit of it. For more details on how it works, click here. The homeless shelter is a single desk around which kids gather when they don’t have the resources to rent their desks. Granted, it sounds a bit harsh. It may even be a bit controversial. Certainly, it gives me no pleasure to see Stevie, Pablo, or Cynthia crowded around a single desk at the front of the room. But isn’t it better Stevie, Pablo, and Cynthia experience the consequences of poor work ethic in fifth grade rather than on the mean streets of real life when they’re twenty? After all, homeless shelters do exist in the real world, and perhaps it’s the threat of landing there that keep many of us working hard. I recently received a text from a former student-teacher telling me her administration has told her to disband or at least rename her “homeless shelter.” I wish I’d been there to lobby her principal and parents, but she’s half way across the country. The best I can do is suggest some politically-correct alternatives. “Group house”, “hostel”, and “shared housing” come to mind. So too does “Dickens’ House” and “Grandma’s Basement.” (Okay, that last one may not be so politically-correct.) Regardless of the name, whether it’s a homeless shelter or merely communal living, it will likely motivate struggling students to work a bit harder. The Checkbook Project is a splendid behavior management system and a great way to teach kids about money. For more information, including how to download all the forms and procedures, click here. Are Your Students Paying Enough Taxes? Right after Spring Break is when many teachers implement The Checkbook Project in their classrooms, so this week I’m foregoing my usual spiel about reader’s theater to instead offer some checkbook tips. If you’re not familiar with The Checkbook Project, it’s a classroom incentive program, a behavioral management system, and a math-heavy financial literacy unit all rolled together. It’s completely free, kids love it, and it’s relatively easy to manage. In my classroom we kick-started our economy three weeks ago by giving each student a $50 “Spring Stimulus.” Already I have kids aspiring to be slumlords. “Mr. Lewis, can I buy that desk at the back of the classroom and charge kids a bunch of money to sit there?” asked one student. Another wanted to know when she can take out a mortgage, and a third was already asking about a business license. Still others are already borrowing money from their friends just to make rent. You can download The Checkbook Project by following this link. Once you do, the following tips will get you off to a good start. 1. Provide help with tax reports. Though not as complicated as the Form 1040 you and I file each April, completing the Friday Tax Report (a key element to the program) is initially challenging for the students. Be sure to file taxes at the end of the very first first week, allow extra time (45-60 minutes), have extra adults on hand if you can, and use a simple 10% tax rate. Once kids get used to filing, you be able to file every other week, you’ll only have to assist your neediest kids, and you’ll be able to raise the tax rate to more complex figures like 17.86%. Their moans and groans will spark a great discussion about how taxes in the real world pay for things like schools, police protection, and sewers. 2. Don’t be too generous. Keep your rewards low and your penalties high. I hand out a $5 bonus for a quiet class, but a $10 fine for a noisy one. I start the project paying fifty cents per percentage points on tests, gradually raising the rate of pay as the trimester continues. For example, if a student gets a 70% (the minimum) on a vocabulary exam, I pay out $35. I raise the rate when I need to increase motivation, but I also decrease it when students are accumulating too great a stash in their checkbook. 4. Phase-in other elements. In Week One we learn how to keep track of our income and expenses and complete our first tax report. At the end of Week Two the kids begin renting their desks. During Week Three I let them begin selling their own items at auction. I wait until weeks Four and Five to let them mortgage their desks, open businesses, and apply for classroom jobs. 5. Don’t be in a hurry to raise desk rent. “Should I buy or rent?” You’ll want kids to wrestle with this question when you begin offering mortgages, but if rents are already excessive, your entire class will become “desk owners” too quickly. One of the richest “teachable moments” is when half the class—the desk owners—have burned their mortgages, while the other half are subject to ever increasing rents. 6. Collect checkbooks every Friday. Doing so makes the student feel more accountable about keeping accurate entries. The only record keeping I do is to write down each student’s ending balance on Friday’s. In so doing I’m able to spot oddities. I can also quickly skim through questionable accounts. When I find one, I usually make an example of him or her with a full audit (and some hefty tax penalties). For more on The Checkbook Project, visit MackLewis.com and click on The Checkbook Project tab. You’ll find more tips and all the forms you need to make the project a hit with your parents, students, and admins. And in case you came here today looking for information on great Read Aloud Plays, please take a few minutes to explore my site, ReadAloudPlays.com and my storefront at TeachersPayTeachers. Happy directing!